A quarter of a century has passed since 'East' and 'West' Germany reunited. The country’s financial capital, Frankfurt, saw hundreds of people protesting in the city during the visit of Chancellor Merkel. The annual celebration of a German national holiday, the 25th anniversary of the reunification of Germany, which took place on Saturday, was marred by a large protest in Frankfurt. Over a thousand people took to the streets of the city prior to the visits of German Chancellor Angela Merkel and President Joachim Gauck, who participated in a church ceremony and walked through the streets to greet hundreds of locals, many of whom wanted to take a selfie with the country’s leaders. “That general feeling – when we are faced with a major task that we can achieve – that, I believe, we can absolutely remember how to do,” Merkel said, linking the current refugee crisis with the challenges of peaceful reunion of the German Democratic Republic (East Germany) and the Federal Republic of Germany (West Germany) on October 3, 1990, as cited by AFP. Following a ceremony in Frankfurt’s cathedral, which marked the silver anniversary of the key date in German history after the Second World War, Merkel called on the international community to help cope with Europe’s migrant crisis. Celebrations are taking place over the weekend all over the country, including in the capital, Berlin, where thousands gathered for a traditional street party at Brandenburg Gate, with stage performances, beer gardens and horse racing at Hoppegarten. But the focal point of the festivities, which traditionally rotates on an annual basis, is Frankfurt which is playing host to pop concerts and an art installation on the Main River. However, over 1,000 people marched through Frankfurt city center on Friday evening to protest the upcoming festivities amid current controversy over social and migration policies. 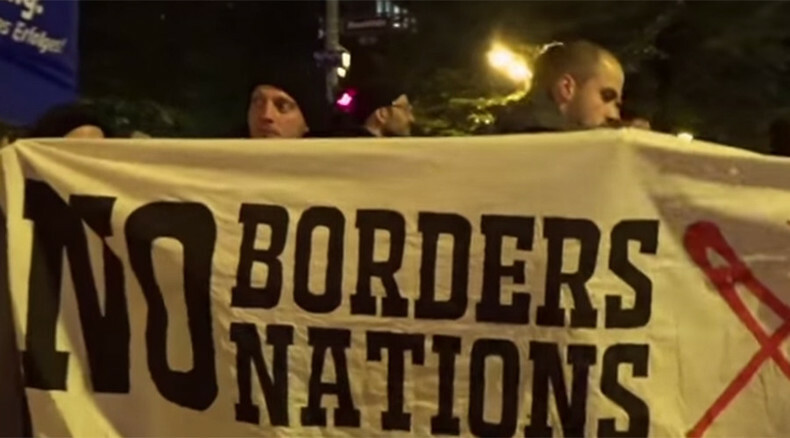 Their banners read “Abolition of borders – Germany defeated,” while people wondered whether there was a real reason for celebration, considering “discrimination, poverty and dissociation” in Germany. The protest continued on Saturday, with around 20 people being detained after clashes erupted between protesters and police. Many former-West Germans believed that the reunification of the country, which had been divided into Allied occupation zones, back into one state, however prosperous it might seem to be now, was followed by economic hardship for their region, such as the influx of jobless former Easterners and the unequal distribution of government funding, based on the need of support for poorer regions of the former GDR. “Just like in 1990 we’re all facing a challenge that will occupy us for generations. But unlike back then, something is now supposed to grow together that has not belonged together until now,” President Joachim Gauck said, as cited by Reuters. Nowadays, the country faces another challenge, as refugees fleeing conflicts in Syria and Iraq travel across Europe to try and settle down on German soil. Only last month, about 200,000 people arrived in the country – a figure that exceeded the number for the whole of the previous year. The country expects over 800,000 migrants to come to the country this year. “If this continues over the next 25 weeks never mind, the next 25 years, all Europe will hate Germany,” Bystron added.